Take last year’s Ray, change the central character from a black man to a white man, add a few more redemption clichés, and you have Walk the Line. It’s remarkable how similar these two films are. There’s the death of a sibling at a young age, the strained relationship with the father, the escape from down-home obscurity to stardom, the womanising, the drug addiction, the crawl back to normality on the back of that sweet gal. On this basis, one might also think that the lives of Ray Charles and Johnny Cash were also practically identical. They weren’t. It’s just that the similarities between their lives are what Hollywood biopics thrive on. I would imagine that a film about any famous person would be the same, if their stardom followed a parabola (a great start, followed by decline, and finally redemption). I knew this would be the case, though. So why did I go along? Well, because of the music, basically. I love Johnny Cash’s music. He’s one of my favourite recording artists. Thankfully, the moviemakers got that part absolutely right: the musical interludes are remarkably close to the original recordings, which is amazing given that Joaquin Phoenix and Reese Witherspoon sung and played their instruments for real. I was hoping for more than that, however. I wanted some kind of insight into Cash the man, something more than the standard biopic clichés that you can see in a hundred other films. Unfortunately, it just isn’t there; I suppose this means I should read more. Not to say that Phoenix and Witherspoon aren’t very good. They pretty much nail their parts, the mannerisms and the emotions, all the while connected with the drama of each scene. Thing is, they’re making the best out of a pretty poor script. The dialogue is forgettable, and everything feels glossed over – pretty much the same problems I had with Ray, except that was longer and slightly better acted so it gets more points in my view. I’m on side with Matt Cale’s suggestion that a better film would’ve focused solely on the events surrounding the concert at Folsom Prison – more and more, I feel that if you narrow your focus and concentrate on getting everything right within that smaller focus, you’re more likely to hit the deeper truths present in the material. A thorough examination of one day in the life of an individual is always more compelling than a shallow overview of their entire life. Seeing this on the same day as Brokeback Mountain brought home to me how good that film was. It was everything this film could’ve been: nuanced, meditative, involving, affecting. 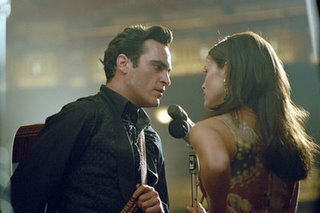 Walk the Line is a showcase for two actors offering their best work, and little more. Besides their performances, it offers nothing you couldn’t get from reading a few articles or the books written by the man himself. Having seen most of this year’s multiple Oscar nominees (only Capote and Memoirs of a Geisha to go), I would suggest that this is the one that is least worth your time.